Na Spa at the boutique Sailrock Resort. Na Spa at Sailrock Resort. Many of the luxury resorts in the Turks and Caicos feature an onsite spa or wellness centre. For some, simply relaxing at the world's best beach may not offer quite enough in the way of tranquillity and wellbeing. 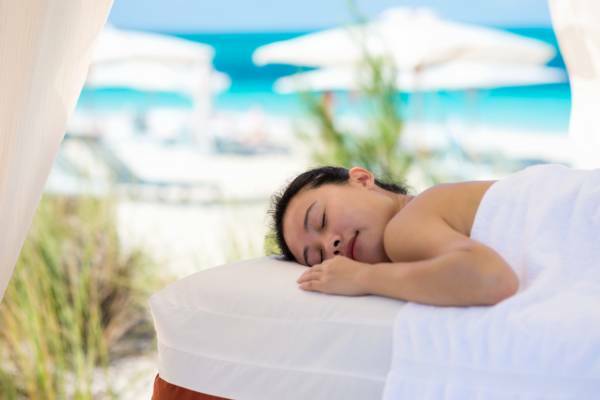 The Turks and Caicos Islands feature a wide arrange of spas, collectively offering a numerous list of treatments. Many of the larger resorts have on-site spas and wellness centres, yet there are also many independent choices as well. A few businesses provide a mobile service, so if you're staying at a vacation villa, they’re able to come right to you. If you’re looking for the ultimate in a serene setting, a few spas also feature ocean and beachfront facilities, perfectly complemented by the breeze. There’s a complete range of spa treatments and amenities to choose from, including cleansing facials, massages, manicures and pedicures, hot stone massages, wax treatments, salt scrubs, and romantic couples massages. Organic products are the typical choice at many of our spas and salons. Many spas offer package deals which combine several wellness treatments under one rate. The typical wellness package includes a full body massage, manicure, and facial. When you book your accommodation, inquire about complimentary spa visits or add-ons, as many of the luxury resorts and villas work with local spa and salon partners. The larger all-inclusive resorts all feature spas on-site, yet be aware that treatment is typically at additional cost to the accommodation stay. Yoga and Pilates is often available as part of a spa wellbeing package, which is a great complement to a massage. Acupuncture treatments are now also offered on Providenciales, and there are a couple of licensed and professionally-trained practitioners that regularly operate on the island. Elevate Spa at the adult-only Beach House all-inclusive resort. We highly advise reserving in advance of expected visit. Many establishments are able to accommodate walk-ins, yet there is no guarantee of availability. Cancellations made with reasonable notice usually do not incur fees or charges, yet enquire before booking if there is a likelihood of such an event. As is the case with many accommodations and activities, rates vary a bit according to the time of year, and tend to be highest during the tourism ‘ high season’. Several varieties of unique Turks and Caicos spa and wellbeing products, made locally in the islands, are available at the shops and boutiques in the Grace Bay region. A great place to shop are the plazas in central Grace Bay, including the Saltmills, Regent Village, and Ports of Call. There’s a wide collection of handmade soaps, exfoliation products, and salt skincare treatments to discover. Natural sea salt was once a critical part of Turks and Caicos history, and at the height of the sea salt industry in the early 1900s, the islands of Salt Cay, South Caicos, and Grand Turk collectively exports millions of bushels of the valuable commodity. The industry ceased in the later 1950s due to the inefficiencies of the small scale production. Today, local gourmet and beauty product businesses have begun to recognize the potential of the boutique Turks and Caicos salt, and there has been an increasing number of unique island salt products appearing, from caramel candies topped with salt, to skin exfoliation treatments. Elevate Spa provides a wide range of services for resort and marina guests at Blue Haven. A wide array of relaxing and invigorating treatments are all available in one of their single or couples' treatment rooms, on board your private boat, or in-room at the resort. 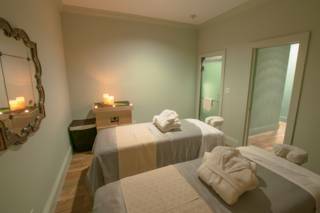 Additional services offered are manicures, pedicures and other beauty treatments, such as salt scrubs and cleansing facials.